Photo courtesy of Carl-Heinz Seelig. Mt Hypipamee crater is a diatreme formed by an explosive eruption of volcanic gases which blasted through solid granite. Angular blocks of granite as large as refrigerators can be found in the surrounding rainforest, giving testimony to the power of the explosion that hurled them there. 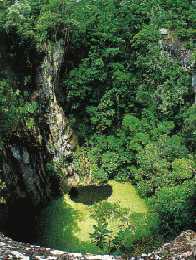 The Crater and Dinner Falls are located about 30km from Atherton on the Kennedy Highway. Just over the Barron River, the turnoff to these two natural attractions is on the right. Mount Hypipamee National Park is the only park that protects high altitude rainforest, unlike any other National Park on the Atherton tableland. The change in soil type influences the vegetation it supports and the diversity of animals which are supported by it. As a result, this area has become renowned for it’s numerous arboreal (tree dwelling), species. Their is a 400m walking track which leads to a viewing platform above the crater. The walk to the crater is well maintained and has been bituminised. This makes for easy walking and wheel chair access . The crater itself is astounding in size and is worth the short walk. A longer 1km track leads to Dinner Falls, at the headwaters of the Barron River, before looping back to the carpark. An information board located close to the beginning of the walk traces the path of the river from its beginnings in the Great Dividing Range, through the Atherton Tablelands and out to the Pacific Ocean.